“One of my favourite new DJs right now!” - The Black Madonna, BBC Radio 1. With a supercharged backlog of award-winning radio shows, electrifying mixes and the sharpest eye for cutting edge new music, Jaguar is one of the most impressive and exciting new DJ's to break out onto the UK scene. Whether she is tearing up clubs, hosting her bi-weekly slot on Reprezent Radio or introducing esteemed DJ’s to the world at Mixmag’s Lab LDN, everything she does is with an authentic energy and positivity like no other. 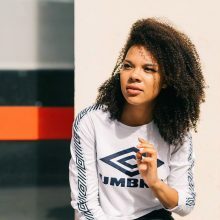 This was instantly picked up by the BBC, who brought her on board their Radio 1 and 1Xtra internship and as a member of its esteemed Youth Council back in 2014. Since then, Jaguar has become part of the cornerstone team for BBC Music Introducing, working behind the scenes, as well as hosting events, stages and from this October, her very own Introducing show, on BBC Three Counties Radio.